Championing women in technology professions plays an important role in diversifying the workplace and improves talent retention. Understanding the challenges women face and allowing women to empower other women to make those career leaps forward is a first-step in transforming the future of tech companies and higher education. 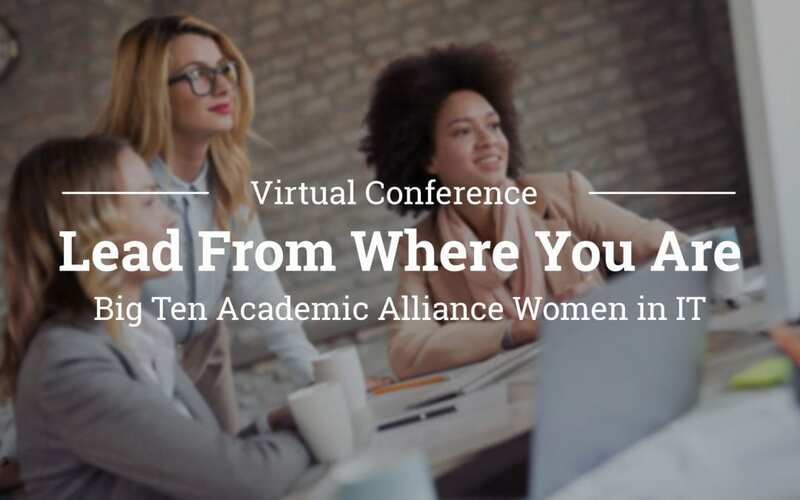 Lead From Where You Are is the first virtual conference sponsored by the Big Ten Academic Alliance Women in IT (WIT) peer group to feature two women keynote speakers as well as a panel of three women at different stages of their IT careers, sharing advice on professional development and other useful resources. The first keynote speaker Maureen Biggers, who is director of Indiana University’s Center of Excellence for Women in Technology, will be discussing inclusive work practices and unconscious bias. Ana Hunsinger is vice president of community engagement at Internet2, and as the second keynote speaker, she will follow-up with a discussion on championing women in IT. The three career panelists will include: Diane Dagefoerde at Ohio State, Kaylah Norris at Rutgers, and Laura Farvour at University of Minnesota. Check out the Big Ten Academic Alliance website for more information.